Thanks so much for posting your pictures and stories here. How is that tree doing as the spring and summer comes? It is rainy today Andy and I took photos ! good to see new leaves - but also !Ouch! I've been reading 'The Overstory' by Richard Powers - highly recommended for nature / tree appreciators. How is the tree looking now? Thanks for asking, Andy. The tree is preparing for autumn and first colors on the leaves show up. 5000 years is beyond belief. Please take a photo for us! Well, I went to visit the Yew tree. Was very much a first visit, a sort of introduction and saying hello. It is an amazing tree - though not in the usual sense of hugeness. It was more a collection of micro ecologies, each deeply connected. 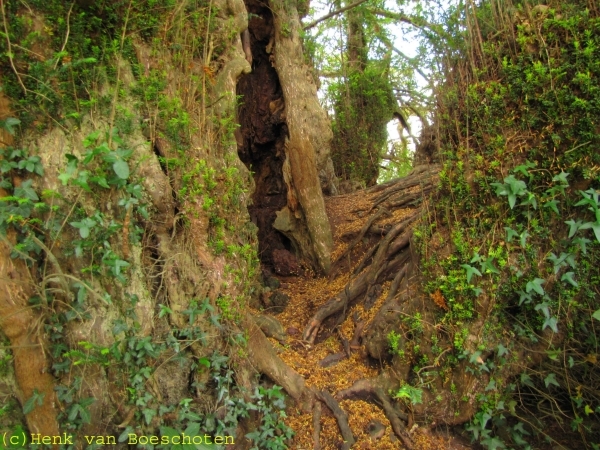 The split trunk rises up out of the ground, which was covered in a deep layer of fallen yew berries - so many that when I walked out I had to scrape about an inch deep off my shoes and then hose them clean back at home. It is possible to walk up and through the gap between the trunks where the original tree centre appears to have turned into soil. There are numerous roots running from both sides interweaving with each other and forming rudimentary steps. There are the usual higher branches, many of which, yew like, are skeletal and patterned or twisted. 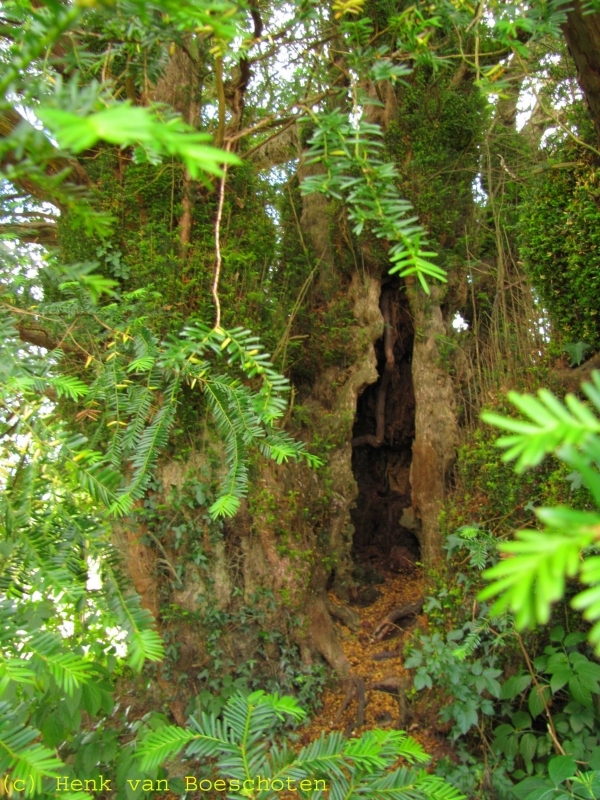 There are burls both on the outside of the trunks and within the inner space that are sprouting dense short branches that look more like yew hedges. Some of the burls have died and the wood is a mixture of the yellow/brown and green. There are lichens growing in various places. In the centre of the trunks the wood is decomposing and some holes are visible through all the layers of wood. In one of the centres is a thick yew root that is clearly feeding another tree somewhere up in the crown area - impossible to tell where the old and newer begin and end. There are spaces where spiders webs have clearly been a long time and a profusion of thin and thick dead branches within the crown and central space. The tree is clearly used by non-Christians, I saw a coin pushed into the dead wood in the centre and a variety of things hung up in the centre. 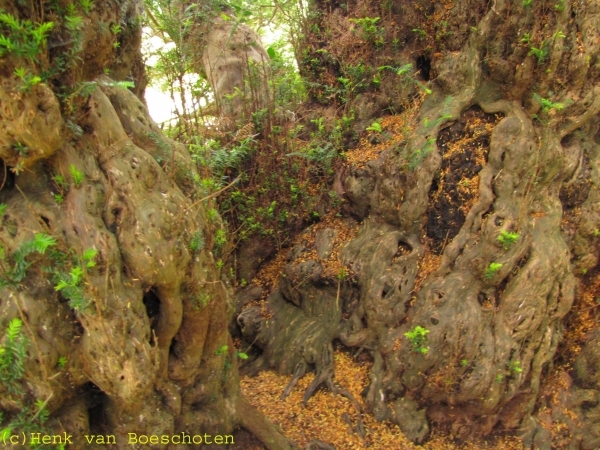 Note the root growing up through the centre of the tree. You can also use www.wetransfer.com It is a comfortable service. It is amazing how you describe the interiour of this ancient entity. Very much looking forward to your photos. 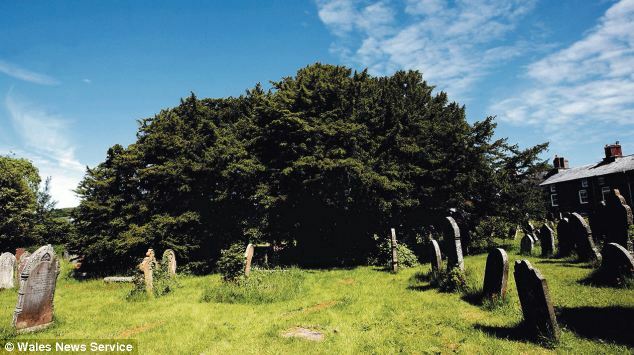 Here are the wonderful photographs of the ancient yew tree. Thanks Andy. Thanks for putting them up for me Jaja. I went back to visit the tree again today with a friend. Not only is everything in the pictures above the same tree - but what I thought was another tree, about 15 foot away is also the same tree....ascertained through DNA testing. Both parts of the tree also have distinct male and female sections. There is a small area of yellow/gold leaves - that is described as 'the Golden Bough'. Such a great story! Trees are real entities.